South Africa has a population of 51 million people with 60 percent of the population living in urban environments and 40 percent living in rural settlements. Currently, South Africa has access to surface water (77 percent of total use), groundwater (9 percent of total use), and recycled water (14 percent of total use) . However, the population’s dependence on water is not evenly distributed. Due to a lack of water infrastructure in rural settlements, 74 percent of all rural people are entirely dependent upon groundwater (i.e. local wells and pumps) . On the other hand, cities with universal water distribution systems get most of their water from surface sources like the Limpopo and Komati rivers . Due to immigration and population growth, growth in rural settlements is putting stress on South Africa’s water supply. Currently, 19 percent of the rural population lacks access to a reliable water supply and 33 percent do not have basic sanitation services . While rural citizens suffer the most, over 26 percent of all schools (urban or rural), and 45 percent of clinics, have no water access either . Despite the apparent lack of water in South Africa, a large portion of South Africa’s GDP is directly dependent upon water. For example, over 15 percent of its GDP comes from agriculture, which uses 60 percent of South Africa’s water supply . 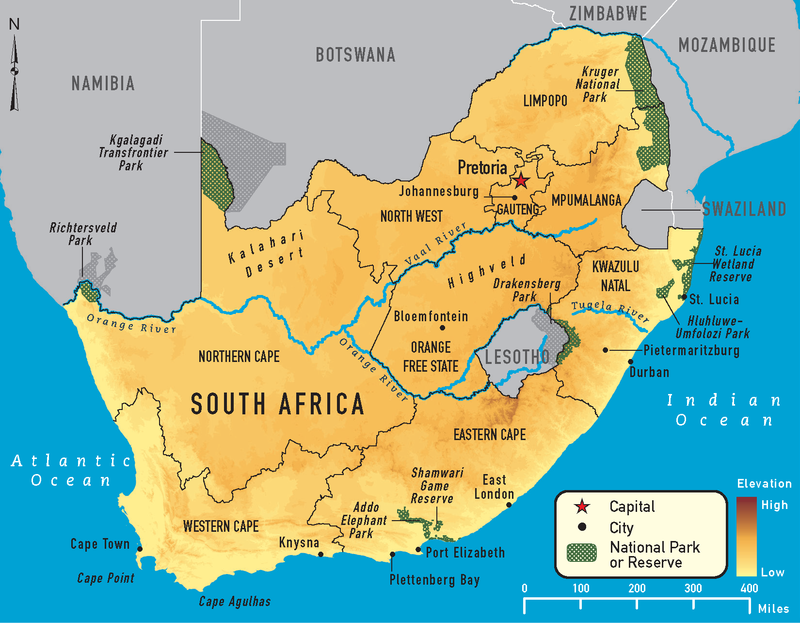 Another major use of South Africa’s water is energy production (2 percent of national supply). In fact, South Africa is the world’s fourth largest exporter of coal. Finally, South Africa’s industry sector, which contributes about 29 percent of the nation’s total GDP, uses almost 11 percent of the nations water . However, because a large portion of South Africa’s industry sector is in mining, the sector’s impact on water goes far beyond 11 percent a year. In fact, the National Water Act was created in 1998 to stop the extensive pollution from mine runoff that severely contaminated South African water supplies . Mission 2017 has identified two parts parts of the water access problem that need to be solved. The first part is to find a way to physically get water to people who need it. The second part is to find an available water source from which water can be given. Currently, South Africa has a policy called Free Basic Water Access. According to the South African Constitution every citizen is entitled to a certain amount of water regardless of his ability to pay for it; this policy defines the amount of entitlement be 6000 liters per household per month . However, the organization in charge of water allocation, the South African Department of Water Affairs and Forestry (SADWAF), is ineffective at determining what amount of water people use per month in rural areas where there is a lack monitoring devices . By not monitoring water usage, SADWAF is unable to determine when a waterline has broken or how much to charge water-users when they go beyond 6000 litres a month. Because broken water lines can be traced to well over 20 percent of all “stolen” or lost water, South Africa loses much of its available water supply due to communication errors . A nationwide installment of water meters, or a device that measures water flow into a household, would help account for missing water. The SADWAF could then bill houses appropriately and begin collecting money for extra water usage. Technicians inside SADWAF would be able to identify if a tap line broke when an erratic drop in water usage occurred. Upon realizing this petrols would be sent out to fix the break and ensure that rural areas have continued access to water. Even though purchasing meters and installing them would cost the South African government money, this money could be raised from the personal income tax . Truthfully, the source of the money does not matter because the cost would be offset by correctly charging for water purchases. Thus, proper management of water will increase Africa’s usable water supply because less of it will be wasted. The next step is establishing access for people without water. An estimated 7 million people that live in rural settlements do not have access to water . Though building up the necessary tap systems (pipes and other infrastructure that will deliver the villages reliable water) is the long term goal, the short term solution would be to use water trucks to bring these settlements water on a weekly (or if necessary daily) basis similar to how the Ethiopian Government supports the Melbena Village by providing the villagers with 6 cubic meters of water at a time . To do this the SADWAF would set up a registration system where government officials identify and sign up each rural community for a water delivery schedule based on the amount of people living there. Because the standard is 6000 liters for a family of 4 per month , trucks would supply each individual with 375 liters of water each week to ensure that quota is met. Not only would this solve the issue of monitoring the amount of water each person has access to but it would also provide the necessary immediate water relief which will saves lives. The long term solution (within 20 years) would be building a communal tap-water system that could make use of groundwater (i.e. using a well) or rainwater. Communal tap systems would be constructed uniquely for each village but they can be as simple as a series of water storage tanks that feed into households or a communal faucet located at the center of the village. Money would be required to build communal systems but there are various routes for this. The cost could be split up amongst the families in the community or the money could come from Private-Public Partnerships (PPP’s) in which private companies partner with either local or national governments to provide the funds to construct a communal tap system . Currently, South Africa is using water within their natural supply’s limits (they are using 98 percent of their predicted total resources). Unfortunately, they are not using it efficiently. In addition to the stolen or lost water, South Africa is also losing over 1.5 billion cubic meters of water a year due to faulty piping infrastructure that has outlived its lifespan . Ideally, broken pipes would be replaced and updated as necessary. However, funds may not be available for this all at once. Due to costs and inefficiencies in bureaucracy, Mission 2017 believes that the time it would take to replace all the necessary pipes and water infrastructure could be greatly reduced if the private sector helped with the repairs (both costs and workers) through PPP’s. In this strategy, the South African government would give out several small contracts to local construction companies and have each company replace the pipes in a given region. To ensure that the pipes are replaced quickly incentives can be used that allow the government to pay the company less if they finish beyond a given deadline. With multiple groups working on the project and each group having a small region, the pipes would be replaced faster. South Africa will face serious water problems if steps are not taken to increase the country’s efficiency of water use or or ability to distribute water to its people. Mission 2017 believes that the solutions outlined above, including the use of water meters and truck delivery routes, will greatly reduce the amount of water being wasted or lost. Though this particular composition of solutions may be unique to South Africa, there are several other countries around the globe that are suffering from similar or related issues to the same or worse extents. Mission 2017 believes it can combat the water issues of any given country by applying the appropriate combination and scale of their solutions.